I had such fun making this box which was to hold two custom made scented votive candles printed with Mr and Mrs which were in the favourite fine fragrance aromas of the happy couple. This box is made of foiled paper which is super thick and more like cardstock. I used a die to cut out the Mr and Mrs topper several times and stacked them together to create a more true metallic feel. The butterfly was die cut from a gorgeous die gifted to me by my lovely friend Martha and I used gold glitter paper to give me the mixed metals theme matching the paper. I finished off with some narrow gauge gold washi tape which really must tied the whole thing together. 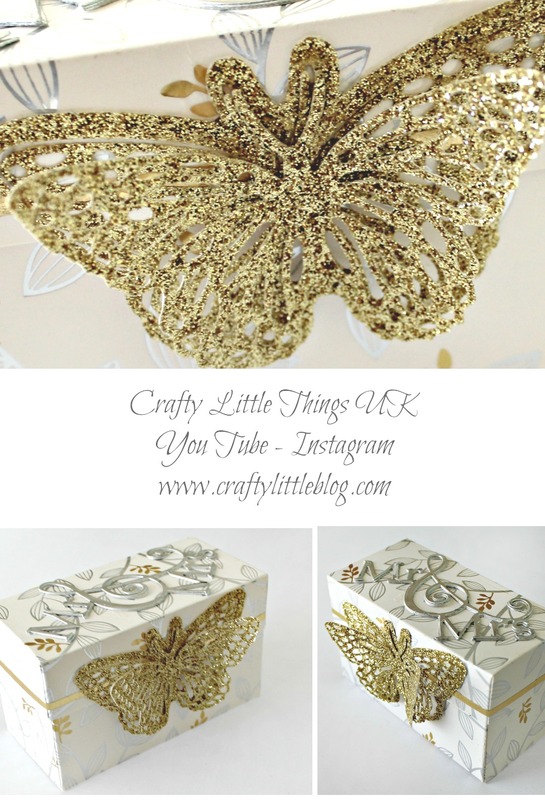 This is such an easy little box to make and is so stunning. My video tutorial gives measurements and more details so why not check that out by clicking HERE.